SendAFrame.com is pleased to offer Free SuperSaver level shipping on most orders over $49.00 to the continental 48 states. SuperSaver shipping arrives in 3-6 business days (might be less if available to ship from the warehouse nearest you!) excluding holidays. This is not a guaranteed delivery date option however. At the discretion of the carrier, delivery may extend up to 8 business days for rural areas. SendAFrame will make every effort to advise of upcoming conditions. We know that you are anxious for your purchase to be shipped quickly and arrive when needed. As we ship with FedEX exclusively, wherever they go, we go; whenever they can deliver, we can deliver. We guarantee that all in-stock orders for 4 pieces or less, cart indicating "can ship today", will in fact ship same day. If you are close to 4pm CST, please check your Cart AND the Confirmation you receive by email. Any holiday variations for specific items will be noted IN RED in your shopping cart as well as in your emailed confirmation. In-stock orders of more than 4 pieces may be delayed 1 business day as we may need the extra time to properly prep your order. In many cases we can ship your order if received later, by 6:00pm CST. Place your order and give us a try. If you don't receive a confirmation within 10 minutes that your order is processing, then shipping will not be done that day. (We don't leave until all orders for that day are processed). Indicate a DELIVERY NEED DATE where prompted upon checkout and we will alert you and/or void the order entirely when reviewed if we can not fulfill your need. Please be certain to choose the shipping method your package needs and include any special handling information in the SPECIAL INSTRUCTIONS box along with your order. Orders will be shipped, based upon availability, from 1 of our 6 warehouses located in: Northern NJ, Eastern MA, Central OH, Chicago IL, Central AR, or Northern CA. Holiday delivery pressures (12/14 through 12/23 and the week prior to Mother's Day or Father's Day) or personalization requests may necessitate delayed shipping. You are notified of this at time of order with our RED ALERT cart window messages. We thank you in advance for your understanding and ask that you please order early, adding a minimum of 3 business days to your transit needs and select the necessary delivery option that will guarantee on-time arrival as prescribed by our carrier. All items not going to the purchaser will be packed as gifts with gift card at no additional charge. A special "no prices" gift receipt will accompany these orders. We greatly value your repeat patronage and we will do whatever is necessary, including continuing to track your package through its travels, in order for your SendAFrame purchase to be a delight. 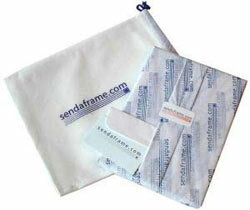 SendAFrame offers four shipping options for delivery within the 48 continental United States. We ship to over 100 countries. When you are ready to check-out an order, click the INTERNATIONAL DESTINATION button to have your order handled by entirely by FedEx for your security and peace of mind. Business days are Monday through Friday, excluding National holidays, as determined by freight carriers. SendAFrame uses FedEx, UPS and the USPS for shipping. FedEx is our preferred carrier and will be used for all situations as the default agent. In all order cases, by authorizing an order with SendAFrame you expressly understand and agree that these premium carriers will be viewed as making their best effort for on-time delivery and their rules and policies will be passed on to you as prescribed by them. In the case of lost, damaged or stolen shipments, carriers are allowed a 5-business-day period from their "last scan" to locate or examine contents before insurance claims will be honored. To our friends shipping to Military, APO addresses and PO Boxes: We will use the FedEX SMARTPOST and/or USPS for shipping to you. Please allow an additional 3-14 days minimum to delivery times for USPS processing. Important: In all such cases, a record acceptance by the USPS will be our only obligation of confirmed delivery as we are not able to secure signature/delivery tracking in these cases. We strongly recommend giving us a street address for deliveries wherever possible and permit us to spend the extra money (cost you nothing) to ship via FedEx. But if you need USPS shipping only, we will gladly comply. SuperSaver: This level is free for all orders over $49, per delivery address. 3-6 business days (might be less if available to ship from our warehouse nearest you! ), excluding holidays (often arrives in 4 or less). $8.95 1st item/set (discounted from $9.50-$15.25); $2.95 each additional item/set; $3.95 1st print; $0.25 for each additional print. Prints at this level are shipped via the USPS, priority mail. Important: This is not a guaranteed delivery date option. At the discretion of the carrier, delivery may extend up to 8 business days for rural areas or outside the US 48 States. SendAFrame will make every effort to advise of upcoming conditions. 3-day: Three business days (or less) by 16:30 (19:00 in some areas), guaranteed, usually by air, when ordered before 5pm EST, excluding holidays. $16.95 1st item/set (discounted from $24.75-$32.80); $8.50 each additional item/set. 2-day: Two business days (or less) by 16:30 (19:00 in some areas), guaranteed, usually by air, when ordered before 5pm EST, excluding holidays. $24.95 1st item/set (discounted from $34.45-$39.75); $9.00 each additional item/set. Next Business Day: Next business day (but not Saturday) by 16:30 (19:00 in some areas), guaranteed, usually by air, when ordered before 5pm EST, excluding holidays. $38.95 1st item/set (discounted from $55.50-$75.00); $15.50 each additional item/set. Next Business Day AM Priority: Next business morning (but not Saturday), usually by 10:30, when ordered before 5pm EST, excluding holidays. (not available to all locations) $74.95 1st item (discounted from $80.00 - $95.00); $18.00 each additional item. This is a very expensive routing method. Although not more difficult for us, the cost is the FedEx charge to have a special courier make the run to your location. Please reserve this method for "need to have" situations only. It is impossible for us to exactly quote the actual shipping costs, but we never want you to pay more than actual cost. We do not try to make any money on shipping charges. If you have your own FedEx account #, we will be pleased to use it for your shipment and have FedEX direct-bill you. Indicate this when you choose a shipping choice. You then won't have any shipping charge from SendAFrame - your charge will be billed by FedEx directly and you pay them directly. To our friends in Alaska and Hawaii: An additional shipping charge of $22.50 per $100 will be added to your order to help defray the actual freight expenses to you which are significantly higher. Again, if you have a FedEx account #, we will be most pleased to have FedEx bill you directly for the actual charges. In all cases, actual delivery time may differ from those suggested by our drop-down choices. [Expect AIR options of 1, 2 or 3 days "guaranteed" to actually have added as much 2 additional days for actual in-transit times and THEN delivery; 3-5 day delivery method may actually be as much as 8 total business days for delivery]. If timing is critical, please contact us directly via email or our LIVE HELP (the small box at top of each webstore page) so that we can get a "firmer" delivery time for you from FedEx. Your understanding is appreciated. We have partnered with FedEx Cross Border®, to service our customers Worldwide with a safe, reliable, and economical delivery process for your important order. Your shipping rate will be automatically calculated based upon weight and size of your packed order during checkout. FedEx Cross Border® (in coordination with SendAFrame) is responsible for all billing and shipping related to your international order. Once you have created your shopping Cart, start your CHECKOUT by choosing the "Outside The U.S.?" button. You will be automatically transferred to a FedEX Checkout Screen where you will be provided with international shipping costs as well as duties and taxes for your shipment. Upon completion of your order, FedEx Cross Border will charge your credit card for the entire purchase. You will receive your order confirmation directly from FedEx Cross Border containing your Unified FedEx Cross Border order number. FedEx Cross Border will process your order (including billing and shipping) and guarantee delivery. The SendAFrame team will be your contact for customer service. If you desire to return your purchase, you may do so within 25 days of delivery. Exception: Purchases made 11/26 to 12/24 may be returned within 45 days of delivery so that return of gifts is easily accommodated). Please inspect your delivery promptly. If contents have arrived damaged it is important that we be notified within 14 days of receipt as insurance does not cover any period longer than this. If you making a return because you did not receive the correct product, SendAFrame will credit the shipping cost at our standard rate. Otherwise, the actual original ship cost will be deducted from your refunded amount. Important Limitations: printed photos, personalized items and special ordered products (including but not limited to: CustomCut frames, items with component assembly, items not originally available at time of order that were special ordered for your order in excess of $200 value and engraved items), may not be returned for refund nor credit. If an error has been made in fulfillment of your order, we will replace with a fully corrected order and pay for return of the incorrect shipment. may be subject to a minimum 20% restocking fee. Items returned in less than original condition are subject to additional charges levied at the sole discretion of the Returns Supervisor. In these instances, customers often ask "why a re-stocking" fee? It is because 1) we send all returns back to the factory where they are gone over and re-packaged so they may be sold again (or not) and 2) orders over $250 required additional 'fragile item' insurance coverage that we did not charge you for. Items returned with damaged original contents and/or packaging will be subject to a minimum 50% restocking fee - and might be a complete denial of credit. Items received in damaged condition without prior communication will be documented for your claim to your insurance carrier. Consideration and waivers are ALWAYS made for customers with an order history with us - or customers asking for a store credit. Please don't be afraid as a previous customer to ask about ordering pieces on approval so that you can view them in your home and see if they work for you. However, please order carefully and ask questions prior to placing an order if you are unsure about the item(s) you are considering. In order to keep our prices low and our costs down, after 24 hours of processing time, special order items serviced "on-time" but subsequently cancelled through no fault of SendAFrame are subject to a 20% handling and service charge. Thank you for your understanding. #1 - Contact our customer service department. If you are reporting damage(s), we will make free replacement, often without the need to return. Damaged pieces that you want bank card credit only for do need to be physically returned. LIVE HELP: The easiest way to contact us is at www.SendaFrame.com and click on the LIVE HELP blue box from any store page. Our LIVE HELP is staffed by employees during all business hours. Description of merchandise, problem, etc. Would you like credit or replacement? Your packing slip will provide most of the information needed - or refer to the YOUR ACCOUNT / ORDER HISTORY section of www.sendaframe.com (login may be necessary) for reference. #2 - FOR RETURNS: you will receive a Return Authorization code (RA #) and instructions via email from a SendAFrame.com customer service representative. The code provided must appear in the address section of your package label. For your security, we recommend that you your return with an insured courier (e.g., FedEx, UPS, USPS Parcel Post) that issues a tracking type receipt - and retain your receipt. This will protect you in-case the package is damaged or lost in transit. Your refund will be made within 7 business days of merchandise receipt to the same form of payment that the sale was made. If you are returning a piece because it is damaged, defective or not the correct product ordered and we are were unable to ship you a free replacement, SendAFrame will also reimburse the the same shipping cost as was selected and you paid for your outbound shipment in your credit. <!--We take the packing of your gifts going to your recipients very seriously. It is evident that many of our customers purchase from SendAFrame because we don't charge for any of the work in preparing gifts. Always with the same care as if you had done it at home - or nicer! As we often tell customers: "We don't charge for handling... ...and certainly wouldn't charge for a little paper, ribbon tape and time!" Unless noted, all items shipping to different addresses than your own are gift packed. There is no charge for this service. In order to continue offering our low prices, please only request gift packing for that actual purpose. We use our glossy white, heavy stock wrap paper that tastefully fits most occasions. Often the box is the manufacturer's gift box, intended for security and brand recognition. The presentation is finished with color-coordinated ribbons and/or bow. Your gift will be artfully wrapped in our signature protective tissue. It is then layered into our mesh prestige pouch and secured with our trademark silken lavender draw-string cord. We will include your personalized Gift Card with any of the gifts ordered. All cards are attractively handwritten by our "best handwriting associate of the day." The Gift Card is securely inserted into the gift thereby preventing it from being lost in the packaging. There are a few exceptions to our gift wrapping policy. In order to ensure safe delivery, we are often unable to wrap large items. These few items are designated as such in the item detail. However, we will gladly "gift it up" with ribbon, etc. and enclose your gift card sentiments. It is not unusual for the US bank card clearing center to not provide a match of name and address submitted. In order to maintain our high security, we may ask that you tele-fax or email an image of both your bank card (front) and an additional piece of identification that contains the address we are shipping to (ex: drivers license, company official purchase order, etc). If able to, doing this in advance will expedite your order. Our international desk telefax # is US +201-355-1501. Please print your email address on the tele-fax for reference. Or, REPLY to your ORDER CONFIRMATION email - (to service@SendAFrame.com) - with an image attachment.